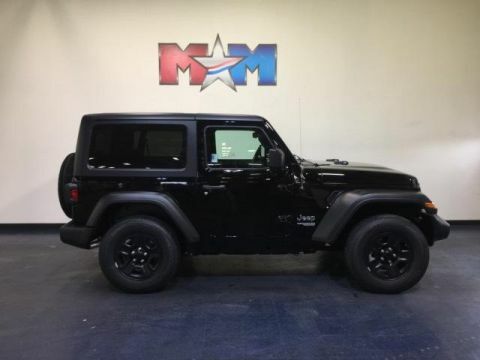 Bluetooth, Keyless Start, Brake Actuated Limited Slip Differential, ENGINE: 3.6L V6 24V VVT UPG I W/ESS, QUICK ORDER PACKAGE 23S SPORT S. Punk'n Metallic Clear Coat exterior, Sport S trim. FUEL EFFICIENT 25 MPG Hwy/17 MPG City! CLICK ME! KEY FEATURES INCLUDE 4x4, Back-Up Camera, iPod/MP3 Input, Bluetooth, Aluminum Wheels, Keyless Start, Brake Actuated Limited Slip Differential. MP3 Player, Privacy Glass, Steering Wheel Controls, Rollover Protection System, Electronic Stability Control. OPTION PACKAGES QUICK ORDER PACKAGE 23S SPORT S Engine: 3.6L V6 24V VVT UPG I w/ESS, Transmission: 6-Speed Manual, Front 1-Touch Down Power Windows, Remote Keyless Entry, Speed Sensitive Power Locks, Leather Wrapped Steering Wheel, Power Heated Mirrors, Automatic Headlamps, Sun Visors w/Illuminated Vanity Mirrors, Security Alarm, ENGINE: 3.6L V6 24V VVT UPG I W/ESS (STD), TRANSMISSION: 6-SPEED MANUAL (STD). EXPERTS ARE SAYING Edmunds.com explains Its turning radius is admirably tight, and it responds well in corners. Despite its boxy shape, the Wrangler feels coordinated and willing on mountain roads, which is great because that's how you get to trailheads.. Great Gas Mileage: 25 MPG Hwy. BUY FROM AN AWARD WINNING DEALER At Shelor Motor Mile we have a price and payment to fit any budget. Our big selection means even bigger savings! Need extra spending money? Shelor wants your vehicle, and we're paying top dollar! Tax DMV Fees & $597 processing fee are not included in vehicle prices shown and must be paid by the purchaser. Vehicle information is based off standard equipment and may vary from vehicle to vehicle. Call or email for complete vehicle specific informatio Chevrolet Ford Chrysler Dodge Jeep & Ram prices include current factory rebates and incentives some of which may require financing through the manufacturer and/or the customer must own/trade a certain make of vehicle. Residency restrictions apply see dealer for details and restrictions. All pricing and details are believed to be accurate but we do not warrant or guarantee such accuracy. The prices shown above may vary from region to region as will incentives and are subject to change. Bluetooth, Keyless Start, Brake Actuated Limited Slip Differential, ENGINE: 3.6L V6 24V VVT UPG I W/ESS, QUICK ORDER PACKAGE 23S SPORT S, 4x4. Black Clear Coat exterior, Sport S trim. FUEL EFFICIENT 25 MPG Hwy/17 MPG City! CLICK NOW! KEY FEATURES INCLUDE 4x4, Back-Up Camera, iPod/MP3 Input, Bluetooth, Aluminum Wheels, Keyless Start, Brake Actuated Limited Slip Differential. MP3 Player, Privacy Glass, Steering Wheel Controls, Rollover Protection System, Electronic Stability Control. OPTION PACKAGES QUICK ORDER PACKAGE 23S SPORT S Engine: 3.6L V6 24V VVT UPG I w/ESS, Transmission: 6-Speed Manual, Front 1-Touch Down Power Windows, Remote Keyless Entry, Speed Sensitive Power Locks, Leather Wrapped Steering Wheel, Power Heated Mirrors, Automatic Headlamps, Sun Visors w/Illuminated Vanity Mirrors, Security Alarm, ENGINE: 3.6L V6 24V VVT UPG I W/ESS (STD), TRANSMISSION: 6-SPEED MANUAL (STD). EXPERTS RAVE Edmunds.com explains Its turning radius is admirably tight, and it responds well in corners. Despite its boxy shape, the Wrangler feels coordinated and willing on mountain roads, which is great because that's how you get to trailheads.. Great Gas Mileage: 25 MPG Hwy. VISIT US TODAY At Shelor Motor Mile we have a price and payment to fit any budget. Our big selection means even bigger savings! Need extra spending money? Shelor wants your vehicle, and we're paying top dollar! Tax DMV Fees & $597 processing fee are not included in vehicle prices shown and must be paid by the purchaser. Vehicle information is based off standard equipment and may vary from vehicle to vehicle. Call or email for complete vehicle specific informatio Chevrolet Ford Chrysler Dodge Jeep & Ram prices include current factory rebates and incentives some of which may require financing through the manufacturer and/or the customer must own/trade a certain make of vehicle. Residency restrictions apply see dealer for details and restrictions. All pricing and details are believed to be accurate but we do not warrant or guarantee such accuracy. The prices shown above may vary from region to region as will incentives and are subject to change. Sport trim, Granite Crystal Met. Clear Coat exterior. 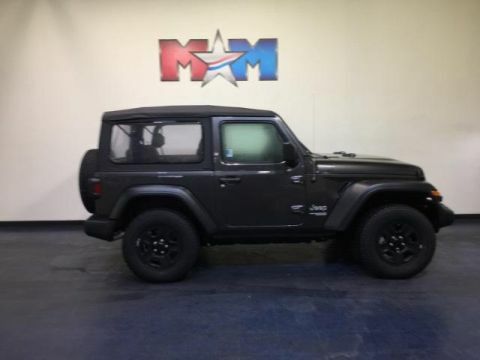 Bluetooth, Keyless Start, Brake Actuated Limited Slip Differential, ENGINE: 3.6L V6 24V VVT UPG I W/ESS, TRANSMISSION: 8-SPEED AUTOMATIC (850R... AIR CONDITIONING, 4x4. CLICK ME! KEY FEATURES INCLUDE 4x4, Back-Up Camera, iPod/MP3 Input, Bluetooth, Keyless Start, Brake Actuated Limited Slip Differential. MP3 Player, Steering Wheel Controls, Rollover Protection System, Electronic Stability Control, Bucket Seats. OPTION PACKAGES TRANSMISSION: 8-SPEED AUTOMATIC (850RE) Dana M200 Rear Axle, Hill Descent Control, TIP Start, AIR CONDITIONING, ANTI-SPIN DIFFERENTIAL REAR AXLE Bridgestone Brand Tires, Tires: 245/75R17 All-Terrain, ENGINE: 3.6L V6 24V VVT UPG I W/ESS (STD). EXPERTS ARE SAYING Edmunds.com explains Its turning radius is admirably tight, and it responds well in corners. 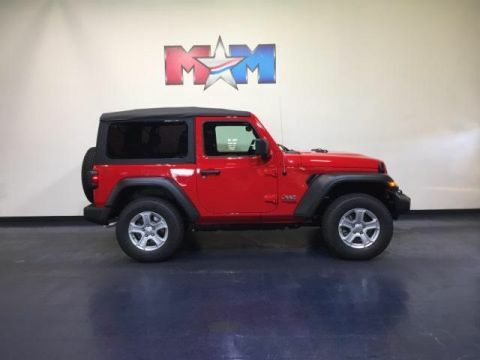 Despite its boxy shape, the Wrangler feels coordinated and willing on mountain roads, which is great because that's how you get to trailheads.. MORE ABOUT US At Shelor Motor Mile we have a price and payment to fit any budget. Our big selection means even bigger savings! Need extra spending money? Shelor wants your vehicle, and we're paying top dollar! Tax DMV Fees & $597 processing fee are not included in vehicle prices shown and must be paid by the purchaser. Vehicle information is based off standard equipment and may vary from vehicle to vehicle. Call or email for complete vehicle specific informatio Chevrolet Ford Chrysler Dodge Jeep & Ram prices include current factory rebates and incentives some of which may require financing through the manufacturer and/or the customer must own/trade a certain make of vehicle. Residency restrictions apply see dealer for details and restrictions. All pricing and details are believed to be accurate but we do not warrant or guarantee such accuracy. The prices shown above may vary from region to region as will incentives and are subject to change. Sport trim, Mojito! Clear Coat exterior. 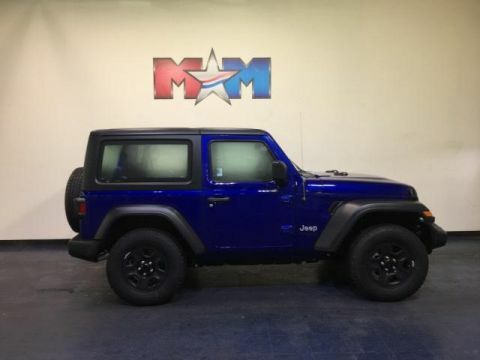 Bluetooth, Keyless Start, Brake Actuated Limited Slip Differential, ENGINE: 3.6L V6 24V VVT UPG I W/ESS, TRANSMISSION: 8-SPEED AUTOMATIC (850R... ANTI-SPIN DIFFERENTIAL REAR AXLE AND MORE! KEY FEATURES INCLUDE 4x4, Back-Up Camera, iPod/MP3 Input, Bluetooth, Keyless Start, Brake Actuated Limited Slip Differential MP3 Player, Steering Wheel Controls, Rollover Protection System, Electronic Stability Control, Bucket Seats. OPTION PACKAGES TRANSMISSION: 8-SPEED AUTOMATIC (850RE) Dana M200 Rear Axle, Hill Descent Control, TIP Start, AIR CONDITIONING, ANTI-SPIN DIFFERENTIAL REAR AXLE Bridgestone Brand Tires, Tires: 245/75R17 All-Terrain, ENGINE: 3.6L V6 24V VVT UPG I W/ESS (STD). EXPERTS RAVE Its turning radius is admirably tight, and it responds well in corners. Despite its boxy shape, the Wrangler feels coordinated and willing on mountain roads, which is great because that's how you get to trailheads. -Edmunds.com. OUR OFFERINGS At Shelor Motor Mile we have a price and payment to fit any budget. Our big selection means even bigger savings! Need extra spending money? Shelor wants your vehicle, and we're paying top dollar! Tax DMV Fees & $597 processing fee are not included in vehicle prices shown and must be paid by the purchaser. Vehicle information is based off standard equipment and may vary from vehicle to vehicle. Call or email for complete vehicle specific informatio Chevrolet Ford Chrysler Dodge Jeep & Ram prices include current factory rebates and incentives some of which may require financing through the manufacturer and/or the customer must own/trade a certain make of vehicle. Residency restrictions apply see dealer for details and restrictions. All pricing and details are believed to be accurate but we do not warrant or guarantee such accuracy. The prices shown above may vary from region to region as will incentives and are subject to change. 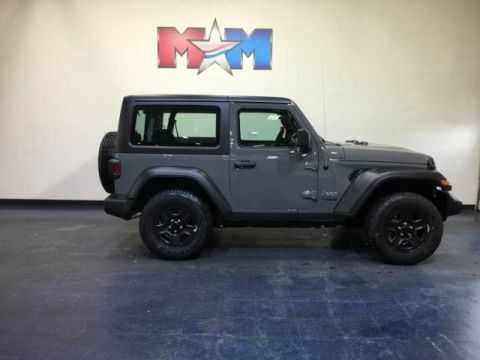 Bluetooth, Keyless Start, Brake Actuated Limited Slip Differential, ENGINE: 3.6L V6 24V VVT UPG I W/ESS, TRANSMISSION: 8-SPEED AUTOMATIC (850R... ANTI-SPIN DIFFERENTIAL REAR AXLE. Punk'n Metallic Clear Coat exterior, Sport trim CLICK ME! KEY FEATURES INCLUDE 4x4, Back-Up Camera, iPod/MP3 Input, Bluetooth, Keyless Start, Brake Actuated Limited Slip Differential MP3 Player, Steering Wheel Controls, Rollover Protection System, Electronic Stability Control, Bucket Seats. OPTION PACKAGES TRANSMISSION: 8-SPEED AUTOMATIC (850RE) Dana M200 Rear Axle, Hill Descent Control, TIP Start, AIR CONDITIONING, ANTI-SPIN DIFFERENTIAL REAR AXLE Bridgestone Brand Tires, Tires: 245/75R17 All-Terrain, ENGINE: 3.6L V6 24V VVT UPG I W/ESS (STD). EXPERTS RAVE Edmunds.com's review says Its turning radius is admirably tight, and it responds well in corners. 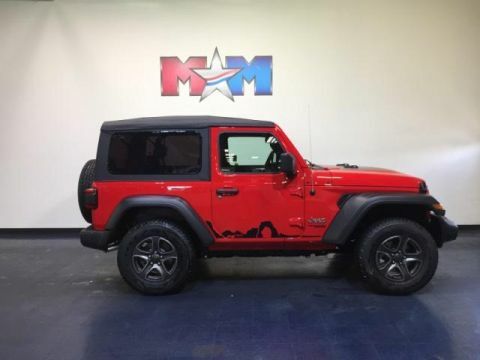 Despite its boxy shape, the Wrangler feels coordinated and willing on mountain roads, which is great because that's how you get to trailheads.. MORE ABOUT US At Shelor Motor Mile we have a price and payment to fit any budget. Our big selection means even bigger savings! Need extra spending money? Shelor wants your vehicle, and we're paying top dollar! Tax DMV Fees & $597 processing fee are not included in vehicle prices shown and must be paid by the purchaser. Vehicle information is based off standard equipment and may vary from vehicle to vehicle. Call or email for complete vehicle specific informatio Chevrolet Ford Chrysler Dodge Jeep & Ram prices include current factory rebates and incentives some of which may require financing through the manufacturer and/or the customer must own/trade a certain make of vehicle. Residency restrictions apply see dealer for details and restrictions. All pricing and details are believed to be accurate but we do not warrant or guarantee such accuracy. The prices shown above may vary from region to region as will incentives and are subject to change. Price includes all applicable rebates, not all buyers will qualify, see a Motor Mile Chrysler/Dodge/Jeep salesperson for details. Other rebates may be available, see a Motor Mile Chrysler/Dodge/Jeep salesperson for details. Price does not include tax DMV fees or $597 processing fee. Firecracker Red C/C exterior, Sport S trim. 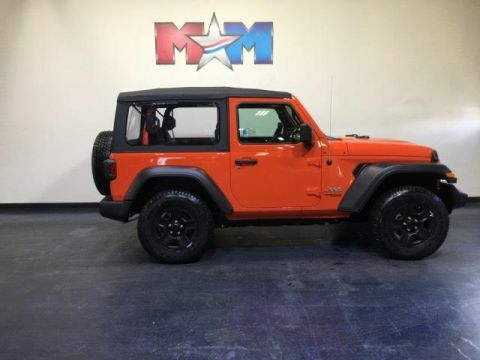 iPod/MP3 Input, Bluetooth, Keyless Start, ANTI-SPIN DIFFERENTIAL REAR AXLE, QUICK ORDER PACKAGE 24S SPORT S, TRANSMISSION: 8-SPEED AUTOMATIC (850R... Back-Up Camera, 4x4. READ MORE! KEY FEATURES INCLUDE 4x4, Back-Up Camera, iPod/MP3 Input, Bluetooth, Aluminum Wheels, Keyless Start. MP3 Player, Privacy Glass, Steering Wheel Controls, Rollover Protection System, Electronic Stability Control. OPTION PACKAGES QUICK ORDER PACKAGE 24S SPORT S Engine: 3.6L V6 24V VVT UPG I w/ESS, Transmission: 8-Speed Automatic (850RE), Front 1-Touch Down Power Windows, Remote Keyless Entry, Speed Sensitive Power Locks, Leather Wrapped Steering Wheel, Power Heated Mirrors, Automatic Headlamps, Sun Visors w/Illuminated Vanity Mirrors, Security Alarm, TRANSMISSION: 8-SPEED AUTOMATIC (850RE) Dana M200 Rear Axle, Hill Descent Control, Tip Start, ANTI-SPIN DIFFERENTIAL REAR AXLE Bridgestone Brand Tires, Tires: 245/75R17 All-Terrain (TQL), ENGINE: 3.6L V6 24V VVT UPG I W/ESS (STD). EXPERTS ARE SAYING Now made of aluminum, the doors are much easier to lift off, especially if you roll down the window so you can reach through and pull the door free with the new handhold under the armrest. -Edmunds.com. BUY FROM AN AWARD WINNING DEALER At Shelor Motor Mile we have a price and payment to fit any budget. Our big selection means even bigger savings! Need extra spending money? Shelor wants your vehicle, and we're paying top dollar! Tax DMV Fees & $597 processing fee are not included in vehicle prices shown and must be paid by the purchaser. Vehicle information is based off standard equipment and may vary from vehicle to vehicle. Call or email for complete vehicle specific informatio Chevrolet Ford Chrysler Dodge Jeep & Ram prices include current factory rebates and incentives some of which may require financing through the manufacturer and/or the customer must own/trade a certain make of vehicle. Residency restrictions apply see dealer for details and restrictions. All pricing and details are believed to be accurate but we do not warrant or guarantee such accuracy. The prices shown above may vary from region to region as will incentives and are subject to change. Mojito! Clear Coat exterior, Sport trim. 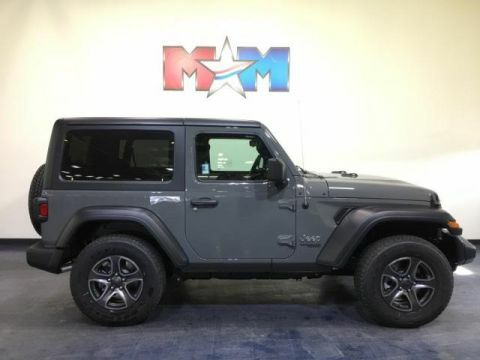 Bluetooth, Keyless Start, Brake Actuated Limited Slip Differential, iPod/MP3 Input, DEEP TINT SUNSCREEN WINDOWS, TRANSMISSION: 8-SPEED AUTOMATIC (850R... AIR CONDITIONING, Back-Up Camera SEE MORE! KEY FEATURES INCLUDE 4x4, Back-Up Camera, iPod/MP3 Input, Bluetooth, Keyless Start, Brake Actuated Limited Slip Differential MP3 Player, Steering Wheel Controls, Rollover Protection System, Electronic Stability Control, Bucket Seats. OPTION PACKAGES TRANSMISSION: 8-SPEED AUTOMATIC (850RE) Dana M200 Rear Axle, Hill Descent Control, TIP Start, AIR CONDITIONING, BLACK 3-PIECE HARD TOP Rear Window Defroster, Freedom Panel Storage Bag, Rear Window Wiper/Washer, No Soft Top, DEEP TINT SUNSCREEN WINDOWS, ENGINE: 3.6L V6 24V VVT UPG I W/ESS (STD). EXPERTS REPORT Edmunds.com's review says Its turning radius is admirably tight, and it responds well in corners. Despite its boxy shape, the Wrangler feels coordinated and willing on mountain roads, which is great because that's how you get to trailheads.. VISIT US TODAY At Shelor Motor Mile we have a price and payment to fit any budget. Our big selection means even bigger savings! Need extra spending money? Shelor wants your vehicle, and we're paying top dollar! Tax DMV Fees & $597 processing fee are not included in vehicle prices shown and must be paid by the purchaser. Vehicle information is based off standard equipment and may vary from vehicle to vehicle. Call or email for complete vehicle specific informatio Chevrolet Ford Chrysler Dodge Jeep & Ram prices include current factory rebates and incentives some of which may require financing through the manufacturer and/or the customer must own/trade a certain make of vehicle. Residency restrictions apply see dealer for details and restrictions. All pricing and details are believed to be accurate but we do not warrant or guarantee such accuracy. The prices shown above may vary from region to region as will incentives and are subject to change. 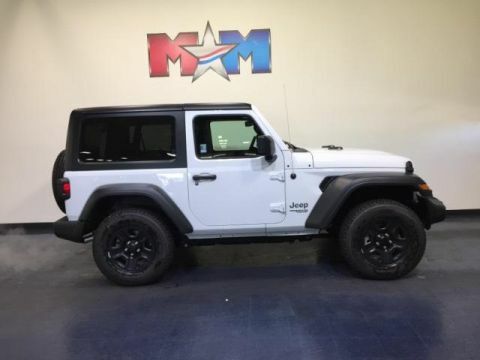 Bluetooth, Keyless Start, Brake Actuated Limited Slip Differential, iPod/MP3 Input, DEEP TINT SUNSCREEN WINDOWS, TRANSMISSION: 8-SPEED AUTOMATIC (850R... ENGINE: 3.6L V6 24V VVT UPG I W/ESS. Sport trim, Black Clear Coat exterior CLICK ME! KEY FEATURES INCLUDE 4x4, Back-Up Camera, iPod/MP3 Input, Bluetooth, Keyless Start, Brake Actuated Limited Slip Differential MP3 Player, Steering Wheel Controls, Rollover Protection System, Electronic Stability Control, Bucket Seats. OPTION PACKAGES TRANSMISSION: 8-SPEED AUTOMATIC (850RE) Dana M200 Rear Axle, Hill Descent Control, TIP Start, AIR CONDITIONING, BLACK 3-PIECE HARD TOP Rear Window Defroster, Freedom Panel Storage Bag, Rear Window Wiper/Washer, No Soft Top, DEEP TINT SUNSCREEN WINDOWS, ENGINE: 3.6L V6 24V VVT UPG I W/ESS (STD). EXPERTS REPORT Its turning radius is admirably tight, and it responds well in corners. Despite its boxy shape, the Wrangler feels coordinated and willing on mountain roads, which is great because that's how you get to trailheads. -Edmunds.com. MORE ABOUT US At Shelor Motor Mile we have a price and payment to fit any budget. Our big selection means even bigger savings! Need extra spending money? Shelor wants your vehicle, and we're paying top dollar! Tax DMV Fees & $597 processing fee are not included in vehicle prices shown and must be paid by the purchaser. Vehicle information is based off standard equipment and may vary from vehicle to vehicle. Call or email for complete vehicle specific informatio Chevrolet Ford Chrysler Dodge Jeep & Ram prices include current factory rebates and incentives some of which may require financing through the manufacturer and/or the customer must own/trade a certain make of vehicle. Residency restrictions apply see dealer for details and restrictions. All pricing and details are believed to be accurate but we do not warrant or guarantee such accuracy. The prices shown above may vary from region to region as will incentives and are subject to change. Ocean Blue Metallic C/C exterior, Sport trim. Bluetooth, Keyless Start, Brake Actuated Limited Slip Differential, iPod/MP3 Input, ENGINE: 3.6L V6 24V VVT UPG I W/ESS, TRANSMISSION: 8-SPEED AUTOMATIC (850R... AIR CONDITIONING. CLICK NOW! KEY FEATURES INCLUDE 4x4, Back-Up Camera, iPod/MP3 Input, Bluetooth, Keyless Start, Brake Actuated Limited Slip Differential. MP3 Player, Steering Wheel Controls, Rollover Protection System, Electronic Stability Control, Bucket Seats. OPTION PACKAGES TRANSMISSION: 8-SPEED AUTOMATIC (850RE) Dana M200 Rear Axle, Hill Descent Control, TIP Start, AIR CONDITIONING, BLACK 3-PIECE HARD TOP Rear Window Defroster, Freedom Panel Storage Bag, Rear Window Wiper/Washer, No Soft Top, ANTI-SPIN DIFFERENTIAL REAR AXLE Bridgestone Brand Tires, Tires: 245/75R17 All-Terrain, ENGINE: 3.6L V6 24V VVT UPG I W/ESS (STD). EXPERTS CONCLUDE Edmunds.com's review says Its turning radius is admirably tight, and it responds well in corners. 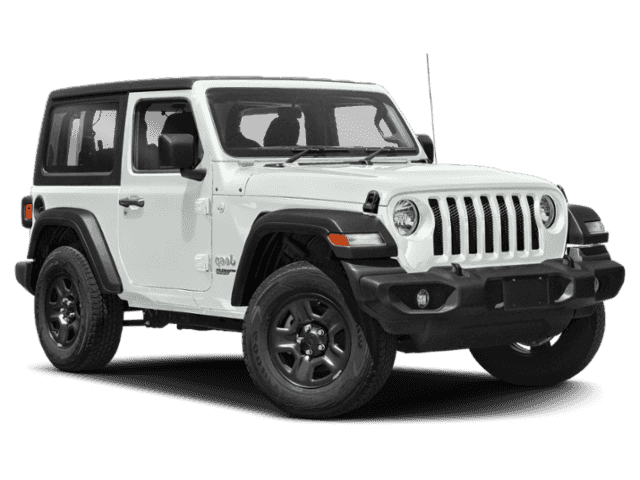 Despite its boxy shape, the Wrangler feels coordinated and willing on mountain roads, which is great because that's how you get to trailheads.. OUR OFFERINGS At Shelor Motor Mile we have a price and payment to fit any budget. Our big selection means even bigger savings! Need extra spending money? Shelor wants your vehicle, and we're paying top dollar! Tax DMV Fees & $597 processing fee are not included in vehicle prices shown and must be paid by the purchaser. Vehicle information is based off standard equipment and may vary from vehicle to vehicle. Call or email for complete vehicle specific informatio Chevrolet Ford Chrysler Dodge Jeep & Ram prices include current factory rebates and incentives some of which may require financing through the manufacturer and/or the customer must own/trade a certain make of vehicle. Residency restrictions apply see dealer for details and restrictions. All pricing and details are believed to be accurate but we do not warrant or guarantee such accuracy. The prices shown above may vary from region to region as will incentives and are subject to change. Sport trim, Sting exterior. Bluetooth, Keyless Start, Brake Actuated Limited Slip Differential, iPod/MP3 Input, ENGINE: 3.6L V6 24V VVT UPG I W/ESS, TRANSMISSION: 8-SPEED AUTOMATIC (850R... ANTI-SPIN DIFFERENTIAL REAR AXLE CLICK NOW! KEY FEATURES INCLUDE 4x4, Back-Up Camera, iPod/MP3 Input, Bluetooth, Keyless Start, Brake Actuated Limited Slip Differential MP3 Player, Steering Wheel Controls, Rollover Protection System, Electronic Stability Control, Bucket Seats. OPTION PACKAGES TRANSMISSION: 8-SPEED AUTOMATIC (850RE) Dana M200 Rear Axle, Hill Descent Control, TIP Start, AIR CONDITIONING, BLACK 3-PIECE HARD TOP Rear Window Defroster, Freedom Panel Storage Bag, Rear Window Wiper/Washer, No Soft Top, ANTI-SPIN DIFFERENTIAL REAR AXLE Bridgestone Brand Tires, Tires: 245/75R17 All-Terrain, ENGINE: 3.6L V6 24V VVT UPG I W/ESS (STD). EXPERTS ARE SAYING Edmunds.com explains Its turning radius is admirably tight, and it responds well in corners. 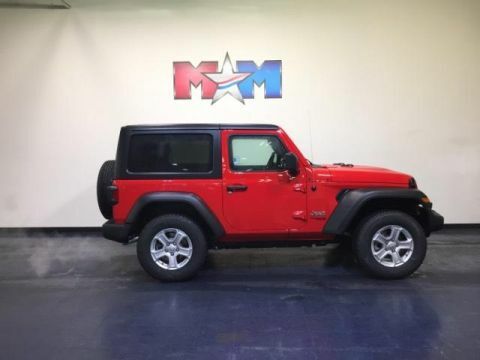 Despite its boxy shape, the Wrangler feels coordinated and willing on mountain roads, which is great because that's how you get to trailheads.. MORE ABOUT US At Shelor Motor Mile we have a price and payment to fit any budget. Our big selection means even bigger savings! Need extra spending money? Shelor wants your vehicle, and we're paying top dollar! Tax DMV Fees & $597 processing fee are not included in vehicle prices shown and must be paid by the purchaser. Vehicle information is based off standard equipment and may vary from vehicle to vehicle. Call or email for complete vehicle specific informatio Chevrolet Ford Chrysler Dodge Jeep & Ram prices include current factory rebates and incentives some of which may require financing through the manufacturer and/or the customer must own/trade a certain make of vehicle. Residency restrictions apply see dealer for details and restrictions. All pricing and details are believed to be accurate but we do not warrant or guarantee such accuracy. The prices shown above may vary from region to region as will incentives and are subject to change. Sport trim, Bright White Clear Coat exterior. iPod/MP3 Input, Back-Up Camera, Keyless Start, Bluetooth, 4x4, ENGINE: 2.0L I4 DOHC DI TURBO ETORQUE... DEEP TINT SUNSCREEN WINDOWS, Turbo. FUEL EFFICIENT 25 MPG Hwy/23 MPG City! CLICK ME! KEY FEATURES INCLUDE 4x4, Back-Up Camera, iPod/MP3 Input, Bluetooth, Keyless Start. MP3 Player, Steering Wheel Controls, Rollover Protection System, Electronic Stability Control, Bucket Seats. OPTION PACKAGES TRANSMISSION: 8-SPEED AUTOMATIC (850RE) Dana M200 Rear Axle, Hill Descent Control, Tip Start, AIR CONDITIONING, BLACK 3-PIECE HARD TOP Rear Window Defroster, Freedom Panel Storage Bag, Rear Window Wiper/Washer, ENGINE: 2.0L I4 DOHC DI TURBO ETORQUE Delete Alternator, GVWR: 5,000 lbs, 700 Amp Maintenance Free Battery, Supplemental Heater, 48V Belt Starter Generator, ANTI-SPIN DIFFERENTIAL REAR AXLE Bridgestone Brand Tires, Tires: 245/75R17 All-Terrain (TQL), DEEP TINT SUNSCREEN WINDOWS, SIRIUSXM SATELLITE RADIO For More Info, Call 800-643-2112, 1-Yr SiriusXM Radio Service. EXPERTS RAVE Edmunds.com's review says Now made of aluminum, the doors are much easier to lift off, especially if you roll down the window so you can reach through and pull the door free with the new handhold under the armrest.. Great Gas Mileage: 25 MPG Hwy. WHO WE ARE At Shelor Motor Mile we have a price and payment to fit any budget. Our big selection means even bigger savings! Need extra spending money? Shelor wants your vehicle, and we're paying top dollar! Tax DMV Fees & $597 processing fee are not included in vehicle prices shown and must be paid by the purchaser. Vehicle information is based off standard equipment and may vary from vehicle to vehicle. Call or email for complete vehicle specific informatio Chevrolet Ford Chrysler Dodge Jeep & Ram prices include current factory rebates and incentives some of which may require financing through the manufacturer and/or the customer must own/trade a certain make of vehicle. Residency restrictions apply see dealer for details and restrictions. All pricing and details are believed to be accurate but we do not warrant or guarantee such accuracy. The prices shown above may vary from region to region as will incentives and are subject to change. 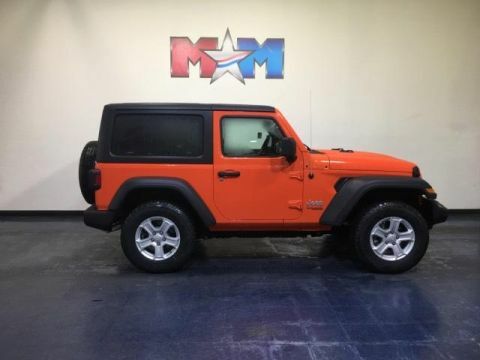 Heated Seats, Bluetooth, Keyless Start, Brake Actuated Limited Slip Differential, iPod/MP3 Input, COLD WEATHER GROUP, TRANSMISSION: 8-SPEED AUTOMATIC (850R... CONVENIENCE GROUP. Firecracker Red C/C exterior, Sport S trim. READ MORE! KEY FEATURES INCLUDE 4x4, Back-Up Camera, iPod/MP3 Input, Bluetooth, Aluminum Wheels, Keyless Start, Brake Actuated Limited Slip Differential MP3 Player, Privacy Glass, Steering Wheel Controls, Rollover Protection System, Electronic Stability Control. OPTION PACKAGES QUICK ORDER PACKAGE 24S SPORT S Engine: 3.6L V6 24V VVT UPG I w/ESS, Transmission: 8-Speed Automatic (850RE), Front 1-Touch Down Power Windows, Remote Keyless Entry, Speed Sensitive Power Locks, Leather Wrapped Steering Wheel, Power Heated Mirrors, Automatic Headlamps, Sun Visors w/Illuminated Vanity Mirrors, Security Alarm, TRANSMISSION: 8-SPEED AUTOMATIC (850RE) Dana M200 Rear Axle, Hill Descent Control, TIP Start, COLD WEATHER GROUP Heated Front Seats, Heated Steering Wheel, CONVENIENCE GROUP Universal Garage Door Opener, ENGINE: 3.6L V6 24V VVT UPG I W/ESS (STD). EXPERTS ARE SAYING Its turning radius is admirably tight, and it responds well in corners. Despite its boxy shape, the Wrangler feels coordinated and willing on mountain roads, which is great because that's how you get to trailheads. -Edmunds.com. VISIT US TODAY At Shelor Motor Mile we have a price and payment to fit any budget. Our big selection means even bigger savings! Need extra spending money? Shelor wants your vehicle, and we're paying top dollar! Tax DMV Fees & $597 processing fee are not included in vehicle prices shown and must be paid by the purchaser. Vehicle information is based off standard equipment and may vary from vehicle to vehicle. Call or email for complete vehicle specific informatio Chevrolet Ford Chrysler Dodge Jeep & Ram prices include current factory rebates and incentives some of which may require financing through the manufacturer and/or the customer must own/trade a certain make of vehicle. Residency restrictions apply see dealer for details and restrictions. All pricing and details are believed to be accurate but we do not warrant or guarantee such accuracy. The prices shown above may vary from region to region as will incentives and are subject to change. Sport S trim, Bright White Clear Coat exterior. iPod/MP3 Input, Back-Up Camera, Keyless Start, Bluetooth, ANTI-SPIN DIFFERENTIAL REAR AXLE, ENGINE: 2.0L I4 DOHC DI TURBO ETORQUE... FUEL EFFICIENT 25 MPG Hwy/23 MPG City! AND MORE! KEY FEATURES INCLUDE 4x4, Back-Up Camera, iPod/MP3 Input, Bluetooth, Keyless Start MP3 Player, Privacy Glass, Steering Wheel Controls, Rollover Protection System, Electronic Stability Control. OPTION PACKAGES QUICK ORDER PACKAGE 28S SPORT S Engine: 2.0L I4 DOHC DI Turbo eTorque, Transmission: 8-Speed Automatic (850RE), Front 1-Touch Down Power Windows, Remote Keyless Entry, Speed Sensitive Power Locks, Leather Wrapped Steering Wheel, Power Heated Mirrors, Automatic Headlamps, Sun Visors w/Illuminated Vanity Mirrors, Security Alarm, TRANSMISSION: 8-SPEED AUTOMATIC (850RE) Dana M200 Rear Axle, Hill Descent Control, Tip Start, BLACK 3-PIECE HARD TOP Rear Window Defroster, Freedom Panel Storage Bag, Rear Window Wiper/Washer, ENGINE: 2.0L I4 DOHC DI TURBO ETORQUE Delete Alternator, GVWR: 5,000 lbs, 700 Amp Maintenance Free Battery, Supplemental Heater, 48V Belt Starter Generator, WHEELS: 17 X 7.5 POLISHED GRANITE CRYSTAL Bridgestone Brand Tires, Tires: 245/75R17 All-Terrain (TQL), ANTI-SPIN DIFFERENTIAL REAR AXLE Bridgestone Brand Tires, Tires: 245/75R17 All-Terrain (TQL). EXPERTS REPORT Now made of aluminum, the doors are much easier to lift off Great Gas Mileage: 25 MPG Hwy. WHY BUY FROM US At Shelor Motor Mile we have a price and payment to fit any budget. Our big selection means even bigger savings! Need extra spending money? Shelor wants your vehicle, and we're paying top dollar! Tax DMV Fees & $597 processing fee are not included in vehicle prices shown and must be paid by the purchaser. Vehicle information is based off standard equipment and may vary from vehicle to vehicle. Call or email for complete vehicle specific informatio Chevrolet Ford Chrysler Dodge Jeep & Ram prices include current factory rebates and incentives some of which may require financing through the manufacturer and/or the customer must own/trade a certain make of vehicle. Residency restrictions apply see dealer for details and restrictions. All pricing and details are believed to be accurate but we do not warrant or guarantee such accuracy. The prices shown above may vary from region to region as will incentives and are subject to change. Sport S trim, Bright White Clear Coat exterior. 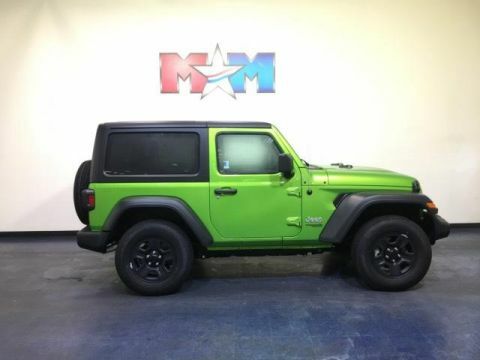 Bluetooth, iPod/MP3 Input, Brake Actuated Limited Slip Differential, Keyless Start, TRANSMISSION: 8-SPEED AUTOMATIC (850R... ENGINE: 3.6L V6 24V VVT UPG I W/ESS, TECHNOLOGY GROUP CLICK NOW! KEY FEATURES INCLUDE 4x4, Back-Up Camera, iPod/MP3 Input, Bluetooth, Aluminum Wheels, Keyless Start, Brake Actuated Limited Slip Differential. MP3 Player, Privacy Glass, Steering Wheel Controls, Rollover Protection System, Electronic Stability Control. OPTION PACKAGES QUICK ORDER PACKAGE 24S SPORT S Engine: 3.6L V6 24V VVT UPG I w/ESS, Transmission: 8-Speed Automatic (850RE), Front 1-Touch Down Power Windows, Remote Keyless Entry, Speed Sensitive Power Locks, Leather Wrapped Steering Wheel, Power Heated Mirrors, Automatic Headlamps, Sun Visors w/Illuminated Vanity Mirrors, Security Alarm, TRANSMISSION: 8-SPEED AUTOMATIC (850RE) Dana M200 Rear Axle, Hill Descent Control, TIP Start, BLACK 3-PIECE HARD TOP Rear Window Defroster, Freedom Panel Storage Bag, Rear Window Wiper/Washer, No Soft Top, TECHNOLOGY GROUP USB Host Flip, Google Android Auto, Air Conditioning w/Auto Temp Control, Radio: Uconnect 4 w/7 Display, 7.0 Touchscreen Display, GPS Antenna Input, Air Filtering, Cluster 7.0 TFT Color Display, Apple CarPlay, Integrated Center Stack Radio, SiriusXM Satellite Radio, For More Info, Call 800-643-2112, 1-Year SiriusXM Radio Service, ENGINE: 3.6L V6 24V VVT UPG I W/ESS (STD). EXPERTS CONCLUDE Edmunds.com's review says Its turning radius is admirably tight WHO WE ARE At Shelor Motor Mile we have a price and payment to fit any budget. Our big selection means even bigger savings! Need extra spending money? Shelor wants your vehicle, and we're paying top dollar! Tax DMV Fees & $597 processing fee are not included in vehicle prices shown and must be paid by the purchaser. Vehicle information is based off standard equipment and may vary from vehicle to vehicle. Call or email for complete vehicle specific informatio Chevrolet Ford Chrysler Dodge Jeep & Ram prices include current factory rebates and incentives some of which may require financing through the manufacturer and/or the customer must own/trade a certain make of vehicle. Residency restrictions apply see dealer for details and restrictions. All pricing and details are believed to be accurate but we do not warrant or guarantee such accuracy. The prices shown above may vary from region to region as will incentives and are subject to change. Punk'n Metallic Clear Coat exterior. 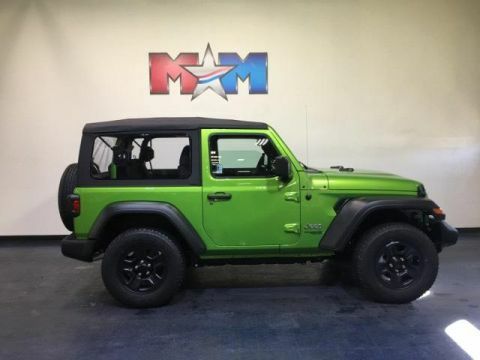 iPod/MP3 Input, Back-Up Camera, Bluetooth, Brake Actuated Limited Slip Differential, Keyless Start, 4x4, ANTI-SPIN DIFFERENTIAL REAR AXLE, TRANSMISSION: 8-SPEED AUTOMATIC (850R... Turbo. SEE MORE! KEY FEATURES INCLUDE 4x4, Back-Up Camera, iPod/MP3 Input, Bluetooth, Aluminum Wheels, Keyless Start, Brake Actuated Limited Slip Differential. MP3 Player, Privacy Glass, Steering Wheel Controls, Rollover Protection System, Electronic Stability Control. OPTION PACKAGES QUICK ORDER PACKAGE 28S SPORT S Engine: 2.0L I4 DOHC DI Turbo eTorque, Transmission: 8-Speed Automatic (850RE), Front 1-Touch Down Power Windows, Remote Keyless Entry, Speed Sensitive Power Locks, Leather Wrapped Steering Wheel, Power Heated Mirrors, Automatic Headlamps, Sun Visors w/Illuminated Vanity Mirrors, Security Alarm, TRANSMISSION: 8-SPEED AUTOMATIC (850RE) Dana M200 Rear Axle, Hill Descent Control, TIP Start, BLACK 3-PIECE HARD TOP Rear Window Defroster, Freedom Panel Storage Bag, Rear Window Wiper/Washer, No Soft Top, ENGINE: 2.0L I4 DOHC DI TURBO ETORQUE 600 Amp Maintenance Free Battery, Delete Alternator, GVWR: 5,000 lbs, 48V Belt Starter Generator, ANTI-SPIN DIFFERENTIAL REAR AXLE Bridgestone Brand Tires, Tires: 245/75R17 All-Terrain. EXPERTS CONCLUDE Edmunds.com's review says Its turning radius is admirably tight, and it responds well in corners. Despite its boxy shape, the Wrangler feels coordinated and willing on mountain roads Great Gas Mileage: 25 MPG Hwy. MORE ABOUT US At Shelor Motor Mile we have a price and payment to fit any budget. Our big selection means even bigger savings! Need extra spending money? Shelor wants your vehicle, and we're paying top dollar! Tax DMV Fees & $597 processing fee are not included in vehicle prices shown and must be paid by the purchaser. Vehicle information is based off standard equipment and may vary from vehicle to vehicle. Call or email for complete vehicle specific informatio Chevrolet Ford Chrysler Dodge Jeep & Ram prices include current factory rebates and incentives some of which may require financing through the manufacturer and/or the customer must own/trade a certain make of vehicle. Residency restrictions apply see dealer for details and restrictions. All pricing and details are believed to be accurate but we do not warrant or guarantee such accuracy. The prices shown above may vary from region to region as will incentives and are subject to change. Firecracker Red C/C exterior, Sport S trim. Bluetooth, iPod/MP3 Input, Brake Actuated Limited Slip Differential, Keyless Start, Back-Up Camera, ANTI-SPIN DIFFERENTIAL REAR AXLE, 4x4, Aluminum Wheels. EPA 25 MPG Hwy/23 MPG City! CLICK ME! KEY FEATURES INCLUDE 4x4, Back-Up Camera, iPod/MP3 Input, Bluetooth, Aluminum Wheels, Keyless Start, Brake Actuated Limited Slip Differential. MP3 Player, Privacy Glass, Steering Wheel Controls, Rollover Protection System, Electronic Stability Control. OPTION PACKAGES QUICK ORDER PACKAGE 28S SPORT S Engine: 2.0L I4 DOHC DI Turbo eTorque, Transmission: 8-Speed Automatic (850RE), Front 1-Touch Down Power Windows, Remote Keyless Entry, Speed Sensitive Power Locks, Leather Wrapped Steering Wheel, Power Heated Mirrors, Automatic Headlamps, Sun Visors w/Illuminated Vanity Mirrors, Security Alarm, TRANSMISSION: 8-SPEED AUTOMATIC (850RE) Dana M200 Rear Axle, Hill Descent Control, TIP Start, BLACK 3-PIECE HARD TOP Rear Window Defroster, Freedom Panel Storage Bag, Rear Window Wiper/Washer, No Soft Top, ENGINE: 2.0L I4 DOHC DI TURBO ETORQUE 600 Amp Maintenance Free Battery, Delete Alternator, GVWR: 5,000 lbs, 48V Belt Starter Generator, ANTI-SPIN DIFFERENTIAL REAR AXLE Bridgestone Brand Tires, Tires: 245/75R17 All-Terrain. EXPERTS CONCLUDE Its turning radius is admirably tight, and it responds well in corners. 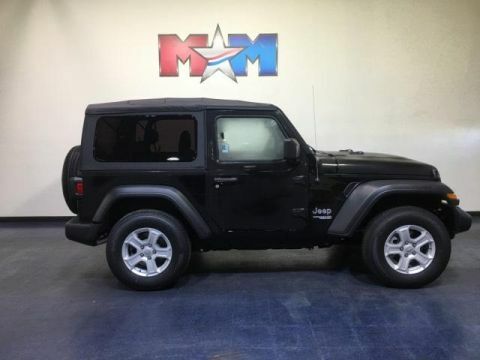 Despite its boxy shape, the Wrangler feels coordinated and willing on mountain roads Great Gas Mileage: 25 MPG Hwy. BUY FROM AN AWARD WINNING DEALER At Shelor Motor Mile we have a price and payment to fit any budget. Our big selection means even bigger savings! Need extra spending money? Shelor wants your vehicle, and we're paying top dollar! Tax DMV Fees & $597 processing fee are not included in vehicle prices shown and must be paid by the purchaser. Vehicle information is based off standard equipment and may vary from vehicle to vehicle. Call or email for complete vehicle specific informatio Chevrolet Ford Chrysler Dodge Jeep & Ram prices include current factory rebates and incentives some of which may require financing through the manufacturer and/or the customer must own/trade a certain make of vehicle. Residency restrictions apply see dealer for details and restrictions. All pricing and details are believed to be accurate but we do not warrant or guarantee such accuracy. The prices shown above may vary from region to region as will incentives and are subject to change. 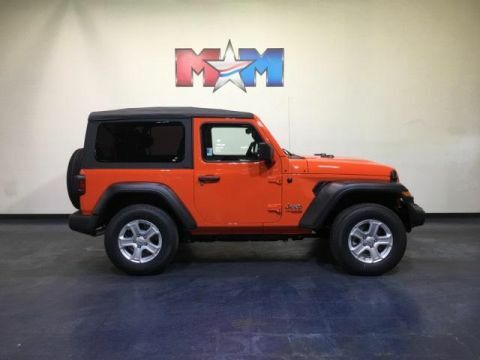 Heated Seats, iPod/MP3 Input, Back-Up Camera, Bluetooth, Brake Actuated Limited Slip Differential, Keyless Start, TRANSMISSION: 8-SPEED AUTOMATIC (850R... ANTI-SPIN DIFFERENTIAL REAR AXLE. Sport S trim, Sting exterior. AND MORE! KEY FEATURES INCLUDE 4x4, Back-Up Camera, iPod/MP3 Input, Bluetooth, Keyless Start, Brake Actuated Limited Slip Differential MP3 Player, Privacy Glass, Steering Wheel Controls, Rollover Protection System, Electronic Stability Control. OPTION PACKAGES QUICK ORDER PACKAGE 24S SPORT S Engine: 3.6L V6 24V VVT UPG I w/ESS, Transmission: 8-Speed Automatic (850RE), Front 1-Touch Down Power Windows, Remote Keyless Entry, Speed Sensitive Power Locks, Leather Wrapped Steering Wheel, Power Heated Mirrors, Automatic Headlamps, Sun Visors w/Illuminated Vanity Mirrors, Security Alarm, TRANSMISSION: 8-SPEED AUTOMATIC (850RE) Dana M200 Rear Axle, Hill Descent Control, TIP Start, BLACK 3-PIECE HARD TOP Rear Window Defroster, Freedom Panel Storage Bag, Rear Window Wiper/Washer, No Soft Top, WHEELS: 17 X 7.5 POLISHED GRANITE CRYSTAL Bridgestone Brand Tires, Tires: 245/75R17 All-Terrain, COLD WEATHER GROUP Heated Front Seats, Heated Steering Wheel, ANTI-SPIN DIFFERENTIAL REAR AXLE Bridgestone Brand Tires, Tires: 245/75R17 All-Terrain, CONVENIENCE GROUP Universal Garage Door Opener, SIRIUSXM SATELLITE RADIO For More Info, Call 800-643-2112, 1-Year SiriusXM Radio Service, ENGINE: 3.6L V6 24V VVT UPG I W/ESS (STD). EXPERTS RAVE Edmunds.com's review says Its turning radius is admirably tight WHY BUY FROM US At Shelor Motor Mile we have a price and payment to fit any budget. Our big selection means even bigger savings! Need extra spending money? Shelor wants your vehicle, and we're paying top dollar! Tax DMV Fees & $597 processing fee are not included in vehicle prices shown and must be paid by the purchaser. Vehicle information is based off standard equipment and may vary from vehicle to vehicle. Call or email for complete vehicle specific informatio Chevrolet Ford Chrysler Dodge Jeep & Ram prices include current factory rebates and incentives some of which may require financing through the manufacturer and/or the customer must own/trade a certain make of vehicle. Residency restrictions apply see dealer for details and restrictions. All pricing and details are believed to be accurate but we do not warrant or guarantee such accuracy. The prices shown above may vary from region to region as will incentives and are subject to change. 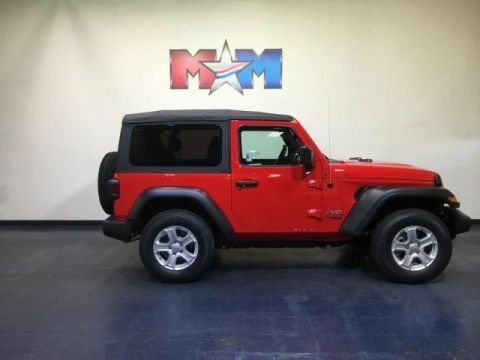 Heated Seats, Back-Up Camera, 4x4, iPod/MP3 Input, Keyless Start, Bluetooth, Turbo Charged Engine, CONVENIENCE GROUP, COLD WEATHER GROUP, QUICK ORDER PACKAGE 28S SPORT S. Firecracker Red C/C exterior, Sport S trim. AND MORE! KEY FEATURES INCLUDE 4x4, Back-Up Camera, iPod/MP3 Input, Bluetooth, Keyless Start MP3 Player, Privacy Glass, Steering Wheel Controls, Rollover Protection System, Electronic Stability Control. OPTION PACKAGES QUICK ORDER PACKAGE 28S SPORT S Engine: 2.0L I4 DOHC DI Turbo eTorque, Transmission: 8-Speed Automatic (850RE), Front 1-Touch Down Power Windows, Remote Keyless Entry, Speed Sensitive Power Locks, Leather Wrapped Steering Wheel, Power Heated Mirrors, Automatic Headlamps, Sun Visors w/Illuminated Vanity Mirrors, Security Alarm, TRANSMISSION: 8-SPEED AUTOMATIC (850RE) Dana M200 Rear Axle, Hill Descent Control, Tip Start, ENGINE: 2.0L I4 DOHC DI TURBO ETORQUE Delete Alternator, GVWR: 5,000 lbs, 700 Amp Maintenance Free Battery, Supplemental Heater, 48V Belt Starter Generator, WHEELS: 17 X 7.5 POLISHED GRANITE CRYSTAL Bridgestone Brand Tires, Tires: 245/75R17 All-Terrain (TQL), SAFETY GROUP LED Taillamps, Injection Molded Black Rear Bumper, Blind Spot & Cross Path Detection, ParkSense Rear Park Assist System, TECHNOLOGY GROUP USB Host Flip, Google Android Auto, Air Conditioning w/Auto Temp Control, Radio: Uconnect 4 w/7 Display, 7.0 Touchscreen Display, GPS Antenna Input, Air Filtering, Cluster 7.0 TFT Color Display, Apple CarPlay, Integrated Center Stack Radio, SiriusXM Satellite Radio, For More Info, Call 800-643-2112, 1-Yr SiriusXM Radio Service, COLD WEATHER GROUP Heated Front Seats, Heated Steering Wheel, ANTI-SPIN DIFFERENTIAL REAR AXLE Bridgestone Brand Tires Tax DMV Fees & $597 processing fee are not included in vehicle prices shown and must be paid by the purchaser. Vehicle information is based off standard equipment and may vary from vehicle to vehicle. Call or email for complete vehicle specific informatio Chevrolet Ford Chrysler Dodge Jeep & Ram prices include current factory rebates and incentives some of which may require financing through the manufacturer and/or the customer must own/trade a certain make of vehicle. Residency restrictions apply see dealer for details and restrictions. All pricing and details are believed to be accurate but we do not warrant or guarantee such accuracy. The prices shown above may vary from region to region as will incentives and are subject to change. New Chevrolet, Ford, Chrysler, Dodge, Jeep & Ram vehicle prices include current factory rebates and incentives some of which may require financing through the manufacturer and/or the customer must own/trade a certain make of vehicle. For all vehicles residency restrictions may apply, see dealer for details and restrictions. Prices do not include tax, DMV fees or $597 processing fee. Shelor Motor Mile	37.1367469, -80.365256.